The Domina Oasis is made up of largely Moorish-style buildings on two floors located on the higher level of the area, near the reception and shopping area. Surrounded by luxurious vegetation that contrasts with the arid Sinai Desert, they offer a magnificent view of the entire bay and the island of Tiran. The 451 rooms are all spacious and comfortable and provided with balcony and terrace which command the whole resort. The Classic garden view rooms are over 40 square metres in size. They are furnished with twin beds and sofa-bed, and have the most modern conveniences. They open onto a balcony or terrace, and face onto the garden. The Classic sea view rooms are over 40 square metres in size. They are furnished with twin beds and sofa-bed, and have the most modern conveniences. They open onto a balcony or terrace, and enjoy a sea view. 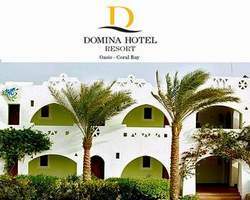 Domina Hotel & Resort Oasis Sharm El Sheikh guests may access all the dining facilities in the resort, according to the terms of the package they have purchased. These include 11 restaurants whose range of offers spreads from buffet to à la carte menu, with dishes from the local, Italian and international traditions; 12 bars; 5 bars next to the pools. Coral, a buffet restaurant for breakfast, lunch or dinner, offers a wide selection of international cuisine and themed dishes. There are 7 meeting rooms that can host up to 1,000 people, offering equipment and services for the perfect success of any convention. The resort allows its guests to enjoy a relaxing, carefree holiday thanks also to the structures and services that are immediately at their disposal: amphitheatre for entertainment; 2 pools; tennis; beach volleyball; diving centre; wellness centre and hairdresser’s; laundry service; mini club and baby sitting service on request; supermarket, bazar and shopping centre; car hire; medical service and pharmacist’s; internal transport service; 24-hour security service.